Arielle, the Mermaid herself, join the Tobacco Plaza team to celebrate her return with an awesome BBQ with fans and the whole Tobacco Plaza gang. Last year at the annual La Zona Palooza event in Miami, I received one of Arielle Ditkowich’s La Sirena Porthole cigars. This particular cigar line was released back in 2015 and was based on a challenge to Ms. Ditkowich to create a cigar for the value minded consumer. The result of that fan challenge was the creation of three cigars that were named the Porthole. There were two blends released in the line and each used a Nicaraguan binder and filler. The wrapper on the first was an Ecuadorian Connecticut and the second used an Ecuadorian Habano Oscuro wrapper. All La Sirena Porthole cigars come packaged in 25-count cabinet boxes with a simple design that further kept the costs down. They are produced at Erik Espinosa’s La Zona factory in Esteli, Nicaragua. 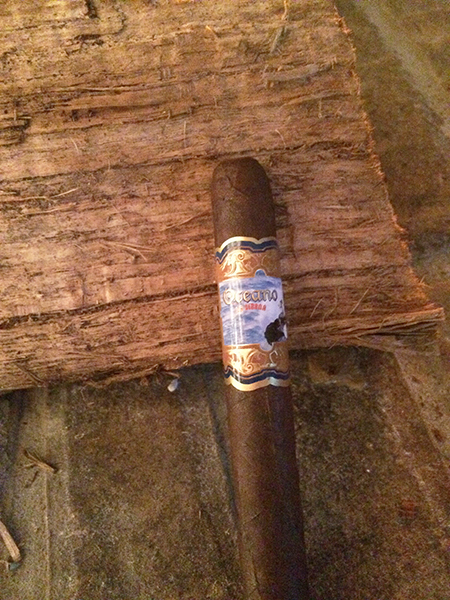 The cigar I received at the event was the Ecuadorian Habano Oscuro Toro Gordo. The La Sirena Porthole Oscuro is a veiny, rugged, and bumpy cigar that is finished with a simple cap. Looks can be deceiving when it comes to cigars and I always say don’t judge a cigar simply by looks. The wrapper is dark brown with some marbling scattered about. 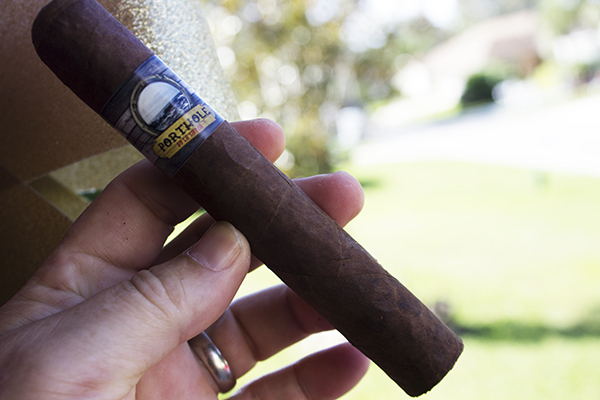 The cigar has a nice weight and there was no noticeable soft spots along the barrel. The Porthole is adorned with a single band, that depicts a porthole looking out over the ocean with a grey wood plank background. The words “Porthole by La Sirena” is printed on a yellow painted wood plank. I like to look of this band, it is definitely unique. The aromas of the Porthole Oscuro certainly lit up my smell sensors with a sweet spicy curing barn aroma along the barrel along with hay and fresh-cut grass off the foot. Once I sliced the cap the cold draw offered a sweet open draw with a slow building pepper as you roll it about. The pre-light exam had me wanting to light this up and see what sub $7.00 can get you in the cigar market and if Arielle Ditkowich met the challenge. Click below for the complete review! Let’s get started! Last week I went on a bit of a La Sirena bender, and I guess I omitted the Merlion brand from that bender, because a package showed up from Danny D this week with a few of the Merlion Robustos and Merlion Maduro Toros with a note thanking me for the post! Merlion Maduro Toro is a favorite of mine, and I have half a box on the shelf, but I’m always happy to add a few to the box, and I’m sure I had some naturals around, so the omission last week was more because I ran out of time than anything else, but I always appreciate the generosity of my friends and valued sponsors! La Sirena is a great little company and produces beautiful cigars which I highly recommend, and will feature prominently in this week’s contest prize, by the way! So I smoked the Merlion Maduro Toro from existing stock, as the ones that arrived this week came off a very hot UPS truck and needed some resting time. The Merlion is made in the DR, with a Mexican San Andrés maduro wrapper, Brazilian Sumatra binder, and Brazilian, Dominican and Nicaraguan fillers. The only difference between this and the “natural” Merlion is wrapper, we’ll get to that later. As I said, this is a cigar I really enjoy. It’s not a traditional Toro, as the size is 5½” x 54, but it has pretty much the same burn time for me, so it’s OK.
Back in 2014, La Sirena Cigars acquired Old School cigars, which went back to about 2007, when Danny Ditkowich and his partners founded the brand.In 2014, Arielle Ditkowich,the president of La Sirena, bought the Old School brands and folded them in to La Sirena, briefly marketing them as Jaxx by La Sirena, Jaxx LT by La Sirena and Stixx by La Sirena. What was cool about this, in my opinion, was that it gave the company some pre-predicate date blends, as well as relationships with two more factories (Jaxx LT at Plasencia in Honduras and Jaxx at Rocky Patel’s Tavicusa in Nicaragua). Of course, La Sirena remains a family operation, with father, Danny involved in the day-to-day operation as well as Mariah adding another face to the brand selling and marketing. Danny is also a partner in the Tobacco Plaza retail store in Great Neck, Long Island, a store I look forward to visiting one of these days (add it to the list!). So that sets up a some back story behind the La Sirena LT, which debuted (that’s an awkward word…”debuted”…so is “awkward”…I digress…) at the 2016 IPCPR. This year they added a new size, a double corona, which is a massive 7 ½” x 52 to the line. Danny was kind enough to send me a couple of these to try, heavily over-packaged, I might add, but assured to make it to me in pristine condition, which is much appreciated. Before I get to the LT DC, since I wanted to give the cigars a rest from their short journey, even though they came in a ziplock with a Boveda, packed in a cigar box, in a bubble UPS mailer, overnighted only about 140 miles, I decided to smoke an old favorite, a La Sirena Trident of a newer vintage. I’ve smoked a bunch of the original, My Father made Tridents, but this is from a newer box, which is out of La Zona. I really enjoy the heck out of these cigars, over the last I don’t know, seven years or so, La Sirena has been a go-to brand for me. There’s something for every occasion in the portfolio, and the Classic line is great evening cigar with some strength and body, and spice. I still have a few of the Don Pepin Tridents left, but it’s unfair to judge a cigar with five years of age to a newer one and expect a fair comparison, but I think the new and the old compare favorably. Thursday evening I decided the La Sirena LT Double Corona had enough time to recover, so I took it for a walk. I mentioned the Jaxx LT above, and the La Sirena LT is the same blend, made at the same factory, Plasencia’s El Paraiso in Honduras. As I said above, this is a 7½” x 52 cigar, set aside two and a half hours if you smoke at a reasonable rate. The usually large looking La Sirena band looks normal on this cigar, and it lacks the small under-band, but it does have a secondary foot-band. Many of the regular La Sirena cigars have a small band under the large one, so those with short memories, like myself, can remember what we are smoking when we take the large band off! Obviously, due to its excessive length, this cigar starts out pretty mild, but it builds up pretty quickly to a reasonably robust smoke for a Connecticut (Ecuadoran). It has a rich flavor, with the sweet grassiness you expect from the Connectucut, but it’s not without body. Like I said, set aside a good amount of time to dedicate to this large cigar, I walked a mile, and still had a whole toro left when I got home! This was perfectly built, burn and draw were as they should be. These carry a $10 MSRP, which seems quite fair in this day and age. I had to continue the La Sirena theme, so Friday I went with another large vitola, from yet another factory that they have making their cigars, Quesada in the DR. I really enjoy the Oceano line, I went with the Atlantic, the large belicoso in the line, at 7″ x 52. This has a Dominican Habano Vuelta Arriba wrapper, Dominican Criollo binder and Dominican Criollo Visos and Ligeros and Nicaraguan Viso in the filler blend. Oddly, it’s a stronger blend than the La Sirena line, certainly the strongest in the portfolio in my estimation. I’ve had this box for about two and a half years, and they just keep getting better and better. It’s kinda on the sweet, peppery and earthy side of the flavor spectrum to me. I really like the blend. I featured the Indian in an article for a 2014 issue of Prime Living Magazine. La Sirena was showing off a couple of items during the 2018 IPCPR Convention & Trade Show. Two of its new ventures include the longest vitola in one of its most popular lines and the re-release of a blend that debuted in 2016. The La Sirena LT gets its fourth—and longest—size, a double corona. The LT is designed to be the mellowest of the company’s portfolio, but don’t confuse it for a bland Connecticut, as the Nicaraguan habano binder adds some punch, while the three-country filler blend adds a good amount of depth and complexity. The La Sirena Box Pressed Lancero is back for a second limited edition run, with all the details remaining the same as the initial batch that was produced in 2016, including Erik Espinosa’s La Zona Cigar Factory handling production. A few months back one of my good friends stopped by the Stogie Press lounge and asked if I ever tried a La Sirena cigar. Being the honest guy that I am, I stated I did not. He recently picked the line up as an independent rep and was quite excited about so we sat down and fired one up and I was impressed with the character of it. He left me some samples to try, which I have had in my humidor for a few months. So now that the craziness of the holidays has past, I decided it was time take one out and do a proper review. A cold front moved into Florida this week and the weather has cooled down nicely. It is, what I consider, near perfect cigar smoking weather – 68 degrees with a slight breeze blowing into the lounge. In fact, I even lit up the fireplace in our new home.